Farm Bill after farm bill, I raised the issue of how farm subsidies left out our black and other small, limited-resource farmers. 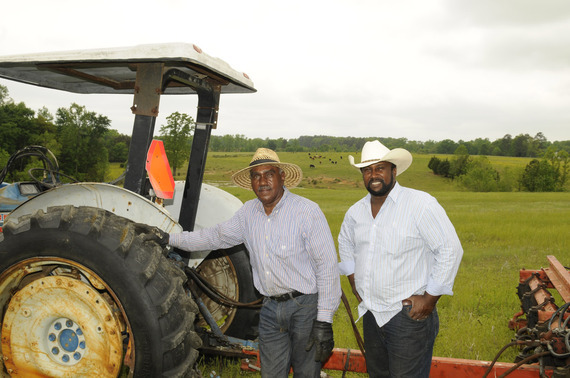 In 2007, the National Black Farmers Association released a joint study (ewg.org/research/short-crop) with the Environmental Working Group. The study highlighted how the gaps between corporate farmers and small farmers were widening. "For too long, our federal crop insurance program has done too much to benefit crop insurance companies and the biggest farm businesses and too little to help small farmers manage the up and downs of agriculture. The reforms included in the budget deal strike the right balance between taxpayers and crop insurance companies, which have enjoyed underwriting gains of more than $12 billion over the last decade. The budget deal guarantees these immensely profitable crop insurance companies a 9 percent rate of return -- a rate of return that far exceeds the profitability of most of America's farmers. Reducing their rate of return from 14 percent to 9 percent will have no impact on the price farmers pay for crop insurance and no impact on the array of choices available to farmers. Giant crop insurance companies should not be profiting at the expense of farmers or taxpayers, and the time to rein in their windfall profits is long overdue." I strongly support crop insurance reform. I would like to see Congress dig deeper and design a more equitable and transparent farm safety net. While I support crop insurance, I think farmers need relief from natural disasters such as floods, hurricanes and tornadoes as they are acts of nature that can wipe out crops. I also believe that more reforms are needed to ensure that the federal crop insurance program does not reinforce the long history of discrimination against minority farmers by the U.S. Department of Agriculture. - A $50,000 payment limit to level the playing field for small and minority farmers. - Means testing to require the largest and most successful farm businesses to share more of their risk management costs. - Greater transparency and disclosure requirement to better assess whether crop insurance subsidies are disproportionately favoring some farmers. - Conservation compliance to ensure that highly erodible lands are being managed to benefit future generations of farmers. What does all this mean? It means as it stands, the small farmer gets less and the bigger farmer gets the most. It's time for America to get educated on how our food system really works. Today the top 1 percent of subsidy recipients receive more than $200,000 annually in premium support while the bottom 80 percent receive about $5,000. Yes, the federal crop insurance program is a farm subsidy. Congress simply changed the name.